Note: Ben Spalding has now left Roganic. Roganic is the two year pop-up restaurant recently opened by Simon Rogan (hence the name Roganic), the head chef behind the critically acclaimed L’Enclume in Cumbria. The pop-up reference relates to the fact that Roganic takes over the remaining two years of the lease at 19 Blandford Street in Marylebone, previously the restaurant, Michael Moore. The current intention may be to operate Roganic for two years only, but it gives Rogan and head chef Ben Spalding a chance to bring to Londoners a sample of the innovative cooking that made L’Enclume such a go-to restaurant for foodies. Two years hardly feels like a pop-up. Be that as it may, it does go a long way in explaining why Rogan has decided to spend very little on refurbishing the restaurant. The dining room is tiny and the décor is rather bland, but with only 25 covers it’s comfortable enough. There is a choice of two tasting menus, a 6-course menu for £55 and a 10-course menu for £80. Allegedly, both menus are designed such that you receive the same quantity of food, even though you obviously get fewer courses with the smaller tasting menu. 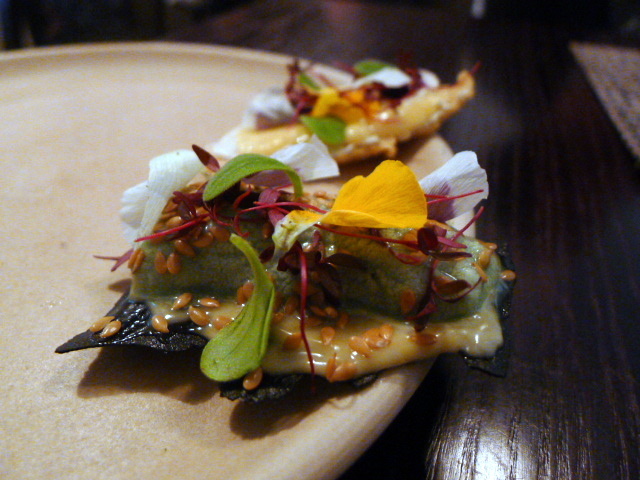 We started with an amuse bouche of squid ink flatbread with aioli, linseeds and cucumber mousse which was lovely. With its delicate hints of cucumber, it was light and refreshing. 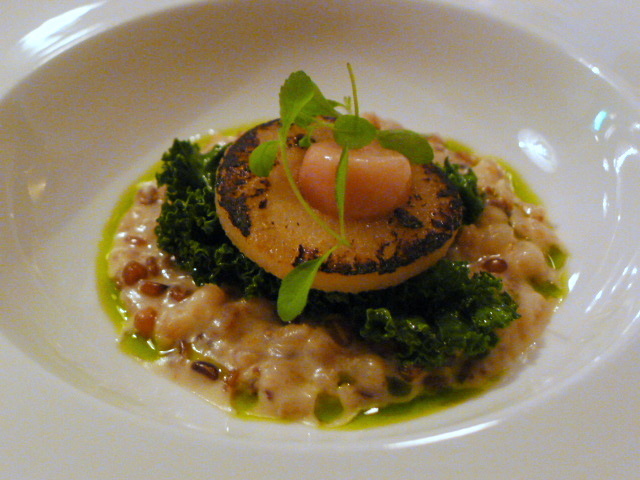 Millet pudding with grains, caramelised pear, curly kale and bone marrow was simply delicious. The pudding, finished with a Devon blue cheese butter oozed with a creamy goodness that gave off subtle hints of the blue. The tender gooeyness of the marrow was a nice finishing touch. A beautiful piece of cured and smoked river tweet trout was served with soured peppers, sorrel, sorrel mousse and a crab apple mousse for a contrast in earthiness and acidity. Accompanying specks of deep-fried shallots were fantastic and light, and provided a crunchy textural contrast to the dish. Royal kidneys (potato) had been cooked in chicken fat for lots of flavour. Topped with a lovely piece of crispy chicken skin for a crunchy effect, goat’s curd and clam juice also ran through the dish to create a warming effect. Skate belly had been cooked perfectly, and was crispy, moist and well seasoned. 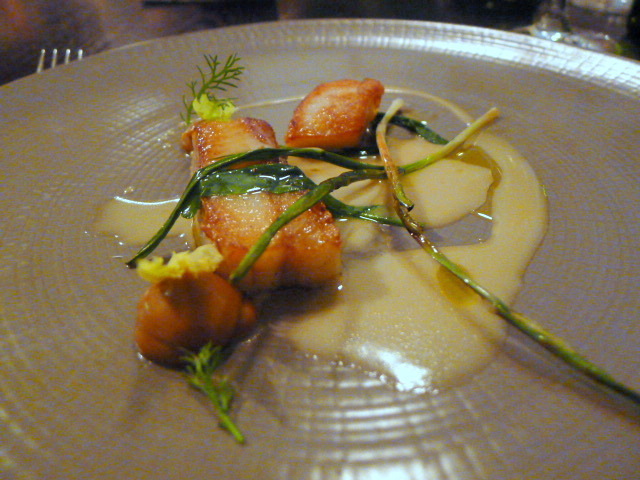 The fish was served with baby leek, a fantastic and well reduced caramelised cauliflower purée, and a piece of king scallop. A sublime Noilly Pratt and fish stock sauce dressed the dish. Cumbrian rose veal poached in buttermilk and pickled garlic was tender but a little dull. 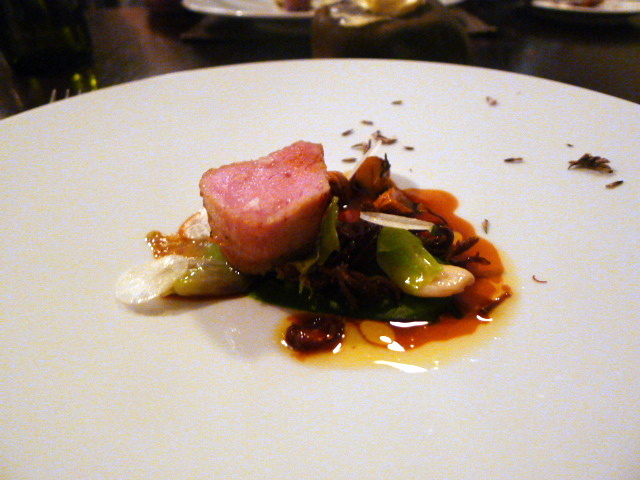 Cobnuts, mead, a wild cabbage purée and a lovely veal jus accompanied the dish. 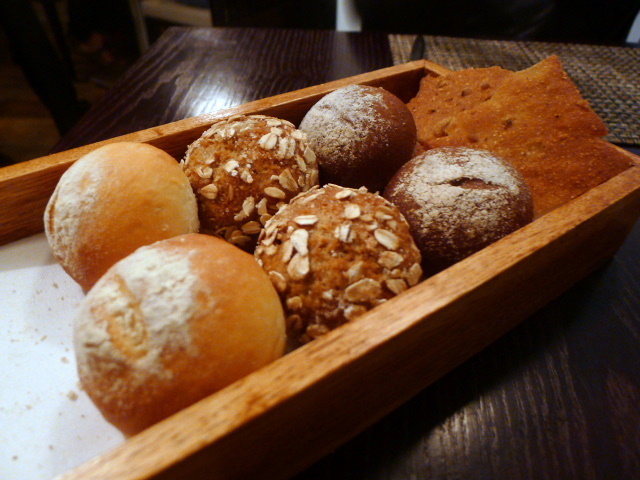 Breads included potato and buttermilk, soda and oats and pumpernickel flatbread. All were good, but the soda with oats was outstanding with its perfect seasoning and hints of sweetness. 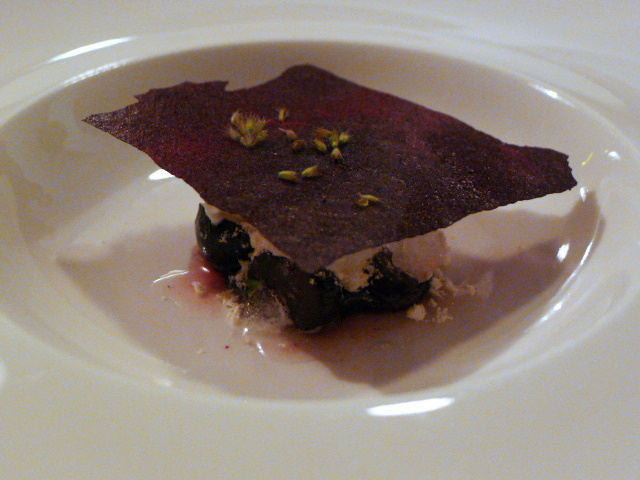 A dessert of bilberries, dried caramel, natural yoghurt and iced lemon thyme was pleasant with fragrant overtones coming through from the thyme. The final flourish was a bay leaf milk shake served with a Roganic jammy dodger. It was yummy and creamy, just like a scrumptious eggnog. This was one of the most spectacularly innovative menus I have come across for a very long time. 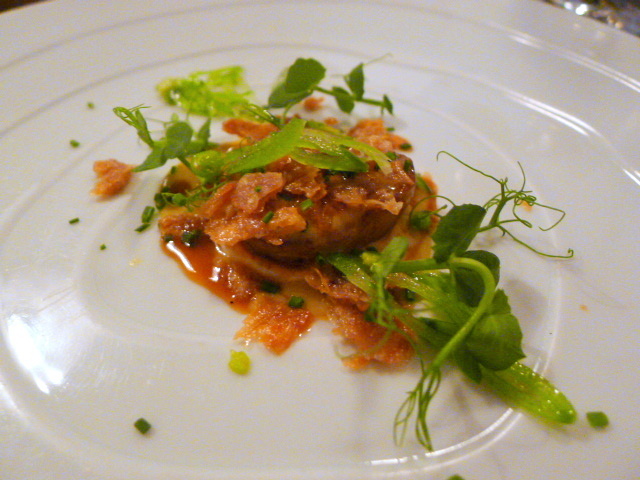 Imaginative and effective ingredient combinations had been cooked with finesse and skill. Portions were small however, small even by fine dining standards, so in some respects this was a meal more to be appreciated and admired than a meal from which to feel satisfied. Nevertheless this was an excellent showcase of superlative cooking. A true foodie restaurant through and through, it would be hard to say goodbye to Roganic if it disappeared in two years time. Just reason then to visit Cumbria and pay homage to L’Enclume. And finally, a quick word on Ben Spalding who previously cooked at Restaurant Lipp in Gothenburg, Sweden, L’Autre Pied and Rhodes W1. He is only 25 years old which I found hard to believe. What I found hard to believe was that someone so young can cook so well. He is surely a star in the making. Price range: 6 course tasting menu – £55, 10 course tasting menu – £80. Excludes drinks and service. I really want to visit Roganic. Have been eyeing up the bread board on a number of blog posts 🙂 and the rest of the food sounds incredible too. Would love to try the real deal up in Cumbria too. you really must go. 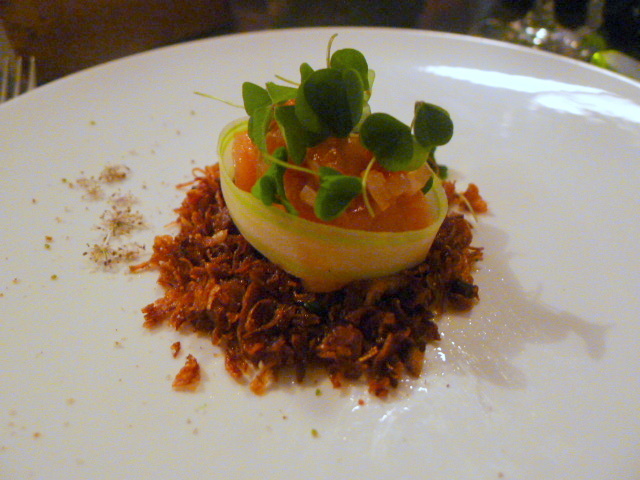 Its probably one of the best restaurants in London at the moment. Re portion sizes, if you compare your photos to mine of the 10-course menu they look similar in size so I’m not surprised you think you’ve been shortchanged somewhat (and I’m glad I went for the big one but I didn’t get the millet pudding). I do hope that Ben will stay around and open a Restaurant of his own after Roganic has gone. With the well-deserved hype he’s getting that shouldn’t be too much of a challenge. This is jumping straight to the top of my ‘to do’ list. Thanks for the lovely kick along…. Definitely worth a visit. It has to be one of the best restaurants in London at the mo. Very foodie.